A case of one man, two coats of arms. The College of Arms have put up a World War I commemorative display on their website. 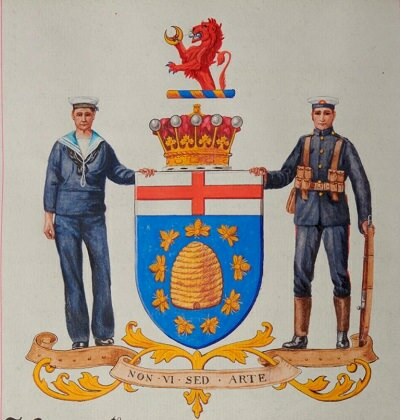 Among the arms displayed are those granted to Admiral of the Fleet Sir David Beatty, who was created an earl in 1919. However, he already had arms, which had been granted to him, and other descendants of his father, David Longfield Beatty, by the Deputy Ulster King of Arms a short while earlier. The date of the English grant is not stated, but must have been on or after 18 October 1919, which is the date on which he was made an earl. Earl Beatty was a second son which may well explain the crescent replacing the wreath in the crest. Each jurisdiction it a law unto itself; at least the major charges and tinctures of the pronomial arms are essentially the same, allowing for artistic differences. Is this sort of chief used by any UK Order of which he may have been a member? No. This can only be an augmentation of honour. No augmentation for a British order of chivalry is included in the holder's arms. Grand Crosses however encircle their arms with the appropriate collar. Beatty was a GCB (1916), GCVO (1917) and OM (1919), so these should have featured in the emblazonment. The English arms as shown without the insignia would serve for Beatty's son, 2nd Earl Beatty, and, presumably for the current Earl. 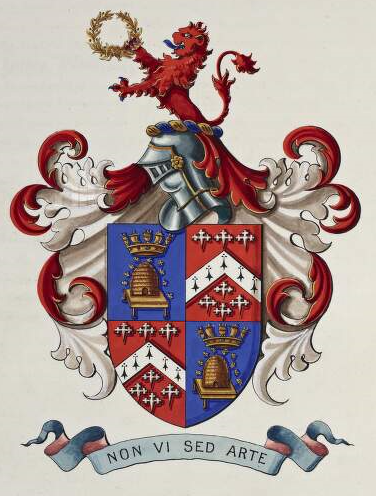 Jeremy Fox wrote: The English arms as shown without the insignia would serve for Beatty's son, 2nd Earl Beatty, and, presumably for the current Earl. Indeed, though the style of the emblazonment is very dated, which suggests that it was intended for the first Earl.